546 pages | 90 B/W Illus. Devising tests that evaluate a nation’s educational standing and implement efficacious educational reforms requires a careful balance among the contributions of technology, psychometrics, test design, and the learning sciences. Unlike other forms of adaptive testing, multistage testing (MST) is highly suitable for testing educational achievement because it can be adapted to educational surveys and student testing. Computerized Multistage Testing: Theory and Applications covers the methodologies, underlying technology, and implementation aspects of this type of test design. The book discusses current scientific perspectives and practical considerations for each step involved in setting up an MST program. It covers the history of MST, test design and implementation for various purposes, item pool development and maintenance, IRT-based and classical test theory-based methodologies for test assembly, routing and scoring, equating, test security, and existing software. It also explores current research, existing operational programs, and innovative future assessments using MST. Intended for psychologists, social scientists, and educational measurement scientists, this volume provides the first unified source of information on the design, psychometrics, implementation, and operational use of MST. It shows how to apply theoretical statistical tools to testing in novel and useful ways. It also explains how to explicitly tie the assumptions made by each model to observable (or at least inferable) data conditions. The 2016 American Education Research Association (AERA) Div. D award committee for Significant Contributions to Educational Measurement and Research Methodology has recognized unanimously this collaborative work advancing the theory and applications of computerized MST. This annual award recognizes published research judged to represent a significant conceptual advancement in the theory and practice of educational measurement and/or educational research methodology. The 2016 award was made under the heading: Measurement, Psychometrics, and Assessment. 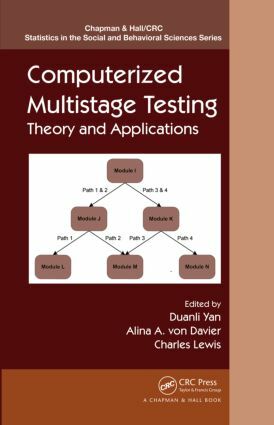 This collective work, published in 2014 as an edited volume titled Computerized Multistage Testing: Theory and Applications, was cited by the committee both for the originality of the conceptual foundations presented in support of multistage testing and for arguing persuasively for its potential impact on the practice of educational measurement. "… this is a terrific book and the editors should be congratulated." MST, CAT, and Other Designs—Which Way to Go? How Accurate Were the Estimates?